If you have prepared for an interview recently (or ever) you’ve likely been told to, “just be yourself!” It’s easy to say and easy to agree with. But what does it really mean to be yourself? What if you don’t know who that is? The temptation, of course, is to start coming up with a mental list of attributes you want to project. Sometimes this can vary to match the job requirements. 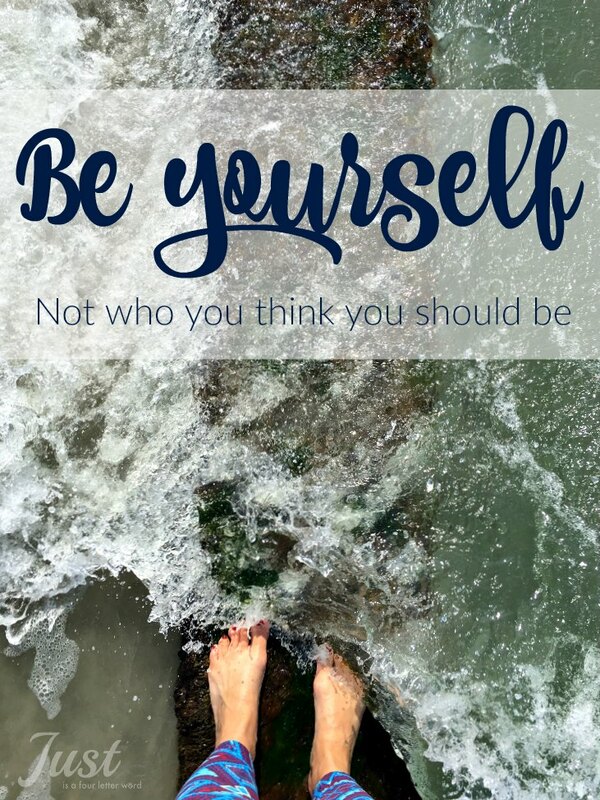 “Be yourself” starts to resemble a pliable resume; sometimes technical, other times fun and light-hearted until over days and months instead of being yourself, you find that you’re right back in the people-pleasing cycle of fitting into someone else’s ideal. It’s maddening. via GIPHYThe answer isn’t as much about finding yourself, but accepting who you really are. For me, that has been the holy grail of my 30s. I’ve spent the better part of the last decade trying to reconcile who I want to be with who I really am. Sometimes I fall into the mask trap and others, I feel like I truly fit. I have so many examples of how this plays out in my life daily, but today I am going to share two. When I applied for the Disney Parks Moms Panel in 2013, it was because of my love of all things Disney and the community I found in my fellow fan-friends. Truth be told, I had a hard time reconciling what I considered to be a “silly passion” with my oh-so-serious real life. Things in the news would get me down and I wondered if pursuing my dream of being on the Panel was a frivolous endeavor. I didn’t make the 2014 Panel. I was bummed out for a while and took it as a sign that there were better things to come. In 2014, I dove into my social media work with BabyCenter and to this blog. I focused on what mattered to me and trying to make the most of each day with my family. My dream didn’t fade. It just took the back burner. The following September, I applied again and as you may know, I was invited to join the 2015 Disney Parks Moms Panel! Now in my second year of answering questions, I know it’s a great fit for me and an extension of who I am. The Panel provides my family with a wonderful vacation each year and I get to use my passion for planning to help others make great memories. I no longer consider it a frivolous endeavor and I truly enjoy what I do. Embracing my passion even after being rejected allowed me to enjoy it whether or not it brought me results. Maybe you have some idea or inspiration that you’ve pushed back because it didn’t seem noble or valuable enough. Maybe it brings you joy but not the results you want. Maybe it’s time to dust that bad boy off and take a step in the direction of your dream. This year is quickly becoming the year of discovery and no example is more on-point than the 6-week class I took at my church this spring. It was billed as a women’s study, but really it wasn’t gender-specific at all. Over a month and a half, we set out to find our gifts and strengths through a combination of personal reflection, conversation and some certified personality tests. My results were pretty surprising to me and I could write volumes on what I am learning. But what I want to share are the top traits from each category. As a Christian, I believe in Spiritual gifts along with personal strengths. Whereas strengths tend to be things we learn and excel at over time and through practice, gifts are those things that seem to come naturally. So I found it really interesting that my top gift was faith and my top strength was positivity. My results-driven brain immediately pushed back with a, “well great, how am I supposed to build a career out of that?” But in the weeks since taking the course, I am really settling into this truth and it is bringing more and more freedom to each day. As the eternal optimist, I can see how these traits weave almost seamlessly throughout my life, my work, and my blog. It’s why I gravitate to positive stories and feel-good places like Walt Disney World. It’s why I have a passion for encouraging other moms who work and steer clear of truly divisive topics. I like to think I am in the soul-lifting business, even if just for a moment. But getting to this point has been a daily struggle and honestly, I don’t think that struggle is going anywhere anytime soon. It’s like going into a fitting room every so often and trying on a bunch of clothes. I’ll see something intriguing and try it on, maybe even take a couple twirls in front of the mirror. Is this me? Is this who I am? While there is definitely value in trying new things, I find that I’m finally starting to settle into a few patterns and I am accepting these patterns as my true self. And what that means is I am free to really dive into those things. I don’t need a new outfit for every occasion or every job. I have a uniform that fits and if I want to break out of the mold every once in a while, it’s fun and doesn’t have to be related to some existential crisis. Instead of looking at the mirror and asking myself what I have to offer, I have a starting point. I am Andrea and my purpose is to lift people up. This can take many forms depending on the day, so it’s not a limitation, it’s a springboard. Maybe it’s time to invest in learning what your strengths are so you can be free to embrace them and stop fighting to be something you’re not. If nothing else, you may just like what you see. Being yourself doesn’t have to be scary and it doesn’t have to be grand. I recently told some friends that my motto for 2016 is, if I live like there isn’t room for everyone, I am going to be the one who is left behind. That means there is room for me. There is room for you. And to take it one step further, if we don’t use the space we are given in this world, someone else will not fill it. It will simply be empty. I’m going to fill the space I’ve been given with the things I love. I hope you will too. I really like your way of thinking. I am also very spiritual and I find my #digitalsabbath so important to me. It helps me step away from all the work and focus in on what I need. Once the 25 hours have ended, I am empowered to face the new week with everything I’ve got! These are great tips, as I think we tend to get caught up at times and forget! Great post! I can definitely relate! It is hard to accept yourself when family rejects that person and expects more, but I am slowly finding my way.